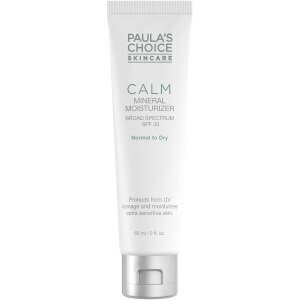 Calm Redness Relief Cleanser for Normal to Dry Skin offers the ease of a rinse-off water-soluble cleanser with the milky texture of a mild cleansing lotion. This lightly lathering formula feels supremely silky and quickly removes all makeup (including eye makeup). It rinses completely, leaving skin beautifully soft, never stripped or irritated. Calm Redness Relief Cleanser is ideal for those with extra-sensitive, reddened skin, including redness from rosacea. Ideal for normal to dry skin. Won’t leave skin stripped or dry. Ideal for sensitive skin, even rosacea. Water, Sodium Laureth Sulfate, Glycol Stearate, Methyl Gluceth-20, Glyceryl Stearate, Hydroxyethylcellulose, Chamomilla Recutita Flower Extract, Aloe Barbadensis Leaf Juice, Cocamidopropyl Betaine, Sodium Cocoyl Glutamate, Disodium Cocoyl Glutamate, Sodium Hyaluronate, Sodium PCA, Caprylyl Glycol, Hexylene Glycol, Propylene Glycol, Citric Acid, Phytic Acid, Phenoxyethanol.